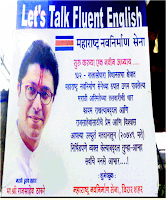 My Small World: Maharashtra - no more a part of India? I think the MNS brigade is going all out to prove nothing...! What do they want? A country of their own? With their menace hitting the news every day, I guess they have become a threat to the national security. In a way it has gone critical beyond the "Pakistan occupied Kashmir" issue..! Who is responsible for their strength - the central Government or the people of Maharashtra? I do have apprehensions about the political driven "Kolkata" & "Bengal" but I guess there's a bigger picture which is out there in Maharashtra..! Are they not citizens of India? If yes, do they know that "Hindi" is our national language.. in short "Rashtrabhasa"? Protecting regional interests is highly solicited but that should not stop people adopting the national language. Also, Mumbai happens to be the commercial hub of India so its quite obvious that career oriented people will flock into the city to build their future. With the caution raised to SBI on its hiring spree, what does MNS wants to prove? If talent is in abundance in Maharashtra then definitely it will shine and people from other states will have lesser opportunity there. But one should not run away from competition on the fear of loosing grounds. Overall... I think MNS should be tackled ASAP else soon... we'll find a new neighboring county "Marathwada"... and that day does not seem to be too far!! This post is not criticize or blame anyone but to tell people that time has come to wake up before its too late..! !